We are your heritage area! The Upper Housatonic Valley National Heritage Area is designated to heighten appreciation of the region, preserve its natural and historical resources, and improve the quality of life and economy of the area. Your donation allows us to continue this important work. 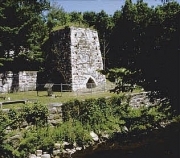 The Beckley Blast Furnace was one of three blast furnaces in operation along Lower Road and the Blackberry River in East Canaan during the period 1832-1923. Knowledgeable guides — members of the Friends of Beckley Furnace — are onsite at the Furnace from 10:00 a.m. to 2:00 p.m. each Saturday in the summer.